Cats very often lead active lives; they are athletic and have an inquisitive nature which can lead them into precarious situations. Jumping awkwardly, falling, traffic accidents or old age can result in tendon/ligament damage, muscle strains or fractures. In addition, cats can suffer injuries and wounds from cat fights. Physiotherapy can provide pain relief and help maintain strength, mobility and independence. Rehabilitation consists of treatment programs including proprioceptive training, exercise and movement therapy. 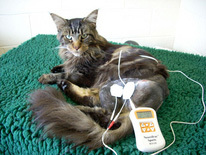 Electrotherapies can also be used to accelerate soft tissue healing and enhance bony repair following fractures.